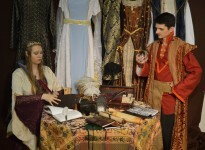 We offer medieval-fantastic clothes and accessories for LARP games or other events at very affordable price. Whether ready-to-wear or custom made, we aim to offer the best value for your weekend outfit so that it doesn’t cost you one week work ! We also offer a lifetime warranty on our seams. We have a “special effects” component with our bright accessories that are also used for LARP organizations who wish to have original elements for animation or their game players.